Martian canyon analogues in the Scablands (Washinton) ? 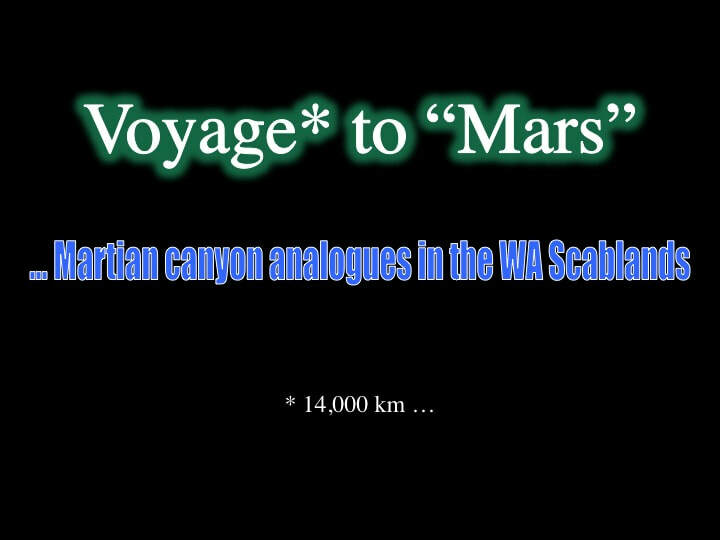 For a more extensive presentation of this voyage, see : Video - OAWS 2014. For more extensive images, including the Burgess Shale and Drumheller dinosaurs, see flickr.com/photos. The notion of “channels” on Mars has fascinated mankind for centuries, including Percival Lovell in the early 20th Century, who was convinced he could see purpose-built artificial “canals” on Mars that were used to irrigate seasonal vegetation. While Lovell was dead wrong on all counts, planetary scientists were nonetheless surprised - as late as the 1970s - when the first orbital probes around the red planet showed just how dry and barren Mars really is. Nonetheless, it turns out that there are many natural channels of all shapes and sizes on Mars, attributed to a variety of geological origins in more hypotheses than you can shake at stick at. This can get very confusing if you just read about it : each proponent is adamant that their hypothesis is the right one. So, I decided to go to “Mars”, and see for myself. Since there are several kinds of martian channels, let’s be clear on what I went to investigate - and we can start by peek at what I was not looking for. On the one hand, this is the Mariner Valley : the largest valley network in the Solar System. 45 years after its discovery, planetary geologists are still arguing about how exactly it initiated. The major problem is that it has been over-deepened and over-widened so much that its origins are obscured - so, I wanted to steer clear of this kind of feature. On the other hand, long, skinny rifts like these have a very special origin that most planetary scientists agree has something to do with some form of collapse due to volume loss just beneath the surface : the debates revolve around what might cause that volume loss. The problem is that since the causal agency is buried, we can’t see it or investigate it directly : so, I struck these off my list too. What I wanted to investigate is the variety of channels referred to as “Outwash Channels”, most of which occur north and east of the Mariner Valley and east of the Tharsis Uplift, seen here in the digital elevation map of Mars - though I will also mention Ma’adim Vallis, located south of Elysium Mons and west of Tharsis. Red is high ground and blue is low ground in this image. As we zoom in we can we can see two of the principal Outwash Channels : Kasei Valles and Ares Vallis (respectively Japanese and Latin names for the planet Mars). Why are they called “outflow” channels ? Because they appear to relate genetically to catastrophic floodwaters flowing out from the Mariner Valley during Mars’ early history (I’ll explain that later). What are the characteristic features of Outwash Channels on Mars ? Well, first - if you remember that the Mariner Valley extends the equivalent distance from Vancouver to Halifax - you can see that these are very large features. They can be 1000s of km long, and 10s of km wide. Ma’adim Vallis is a small example. About 700 km long, it’s mildly curvilinear (not dead straight), it has very steep sidewalls and - most importantly - it has no tributary valleys related to its formation. In short, this is not your typical river valley, which would be a system of multiple converging channels (tributaries). BTW : it emptied downstream into Gusev Crater (top), which is where the Spirit rover was sent by NASA. This steep walled, flat bottomed form - so characteristic of martian outflow channels – has even inspired space artists to offer up their visual impressions of what it would be like to be there on the ground. Here’s an oblique, 3D perspective image from ESA of Reull Vallis, located east of the Hellas Basin. Again, note the slightly curvilinear shape, the very steep sidewalls, the flat channel floor - and no tributary valleys. The grooves along the channel floor are likely related to later glacial activity, so ignore them for now. This is an overhead view directly down into a segment of one of the channels of Cerberus Fossae, SE of Elysium Mons. Again, note the vertical sidewalls and the flat channel floor - here with a train of late sand dunes. In addition to the gently curving outwash channels we’ve just looked at, there’s an entire population of very squiggly channels – like this one : Nanedi Vallis. Like the gently curving ones, they are hundreds of km long, with steep sides and flat floors – and no tributaries - but their key characteristic is their squiggly trace. At first glance you might think these are river meanders, but these are more chaotic looking than classical river bends. Here’s another example of the same squiggly shape – Nirgal Vallis, between the Mariner Valley and Argyre Basin – just to emphasise the point. … and the very best stuff is located in this red box. Even in this digital elevation model we can clearly see that Kasei Valles is made up of a series of channels that wrap around and define both high- and low-standing erosional remnants (islands). This is a photographic representation of the red box from the previous slide - and we can see the same broad features I just indicated. I find that this oblique 3D perspective rendering from ESA helps to better locate and picture the main elements of our Outwash Channel. Let’s now take a brief look in detail at these key features that define outwash channels on Mars. 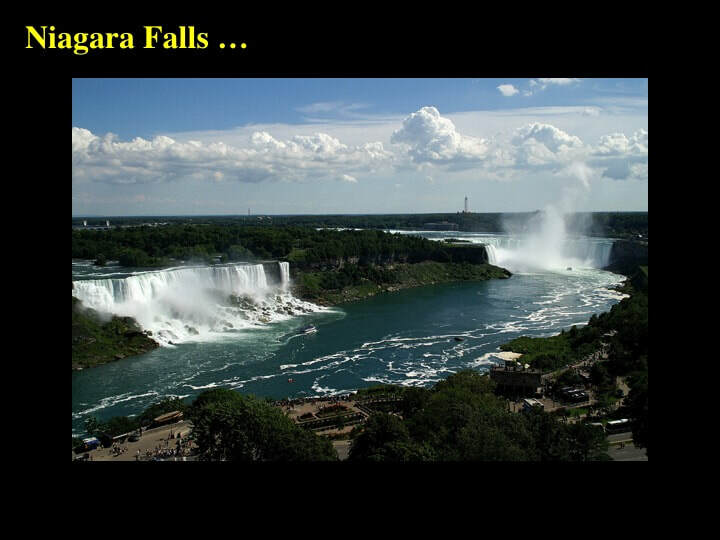 Think Niagara : multiple waterfalls separated by “dry” cliffs ... or Victoria Falls in East Africa. Now imagine turning off the tap - what would those waterfalls looking like ? 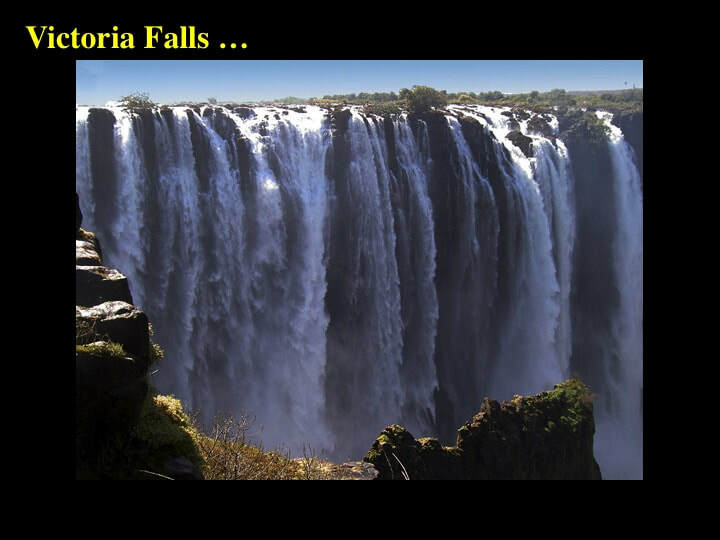 This is a close up of the red box on the left from 3 slides back showing what planetary geologists think Niagara and Victoria Falls would look like if the water was turned off : multiple, curved alcoves or cataracts in very steep cliffs - up to 400m high. By Earth standards, these are gigantic. Upstream is to the left. Here they are in detail. Notice the stubby promontories of rock that separate some of the cataracts from their neighbours. Finally you can see the same thing at the head of this subsidiary channel (upstream is to the left). Planetary geologists interpret this particular example by analogy with the Niagara Falls that have eroded their way back upstream over a distance of ~10km in 10,000 years since the end of the last ice age - except that this martian subsidiary channel is about 200 km long - and the waterfalls would’ve started at the downstream end (right). By Earth standards, that would seem to be a lot of erosional migration ! By putting together the presence of dry waterfalls – or cataracts – that eroded back upstream, with the presence of islands as erosional remnants of either bedrock or sediments within branching channels, planetary geologists arrive at the currently predominant model for outwash channels on Mars : erosion by water. Why did I just describe Kasei Valles in such detail ? Because it’s the only known example of a martian channel – of any kind – with visibly obvious cataracts. In short, a lot of stock is being invested by planetary scientists in very few observations. Whatever, how do they arrive at the conclusion that the water was floodwater, and catastrophic floodwater at that ? Computer models - but what’s their observational evidence ? They don’t have any - Instead they draw analogies with a location on Earth where observational evidence can indeed be found in favour of truly catastrophic floodwaters that carved outwash channels into solid basalt lava bedrock - in 3-7 days ! Where is this natural laboratory you ask ? In the Channelled Scablands of Washington state, in the US - and this is what I refer to as “Mars”. Once upon a time, ~15,000 years ago, as the end of the 2 million year long Ice Age approached, rivers in the NW US that flowed to the Pacific Ocean were dammed by ice. Upstream of that ice dam, parts of Montana were covered by a lake, 700m deep and the size of lakes Erie and Ontario combined – referred to by geologists as Glacial Lake Missoula. One fatal day, the ice dam broke - and Glacial Lake Missoula emptied in less than a week as its waters rushed to reach the Pacific, wreaking catastrophic erosional havoc on their way westward, especially in what we now call the Channelled Scablands of western Washington. The floodwaters from Glacial Lake Missoula cut spectacular outwash channels, the largest being Grand Coulee. You may have heard of the Grand Coulee Dam, which is close by. Note the key features : gently curving, very steep to vertical walls and a flat floor, and – take my word for it – no tributaries. Here we're looking downstream. This, and those that follow, are my photographs. Does Grand Coulee remind you of something ? The outwash channels are all cut into bedrock made of an enormous pile of horizontal basalt lava flows – almost 2km thick - formed by volcanic eruptions that occurred ~15 million years ago – long before the last Ice Age even started. These lavas are an important aspect of the analogy drawn between the Channelled Scablands and martian outflow channels : remember, most of the martian crust is made of just such basalt lavas, locally covered by sediments. The lava flows are spectacularly displayed in this image - but you can also see that this large outwash channel that cuts down into them also has some sharp bends along its course. Here’s a cliff, ~50m high where you can see several horizontal lava flows. Notice the vertical fractures – referred to as columnar joints : they’re specific to basalt lavas, and they’re everywhere in the Channelled Scablands ! What are they ? : cooling fractures. Basalt lavas erupted at the surface cool and crystallise relatively quickly. As they do so, the cooling rock shrinks. That shrinkage is expressed within the lava flow as sets of vertical columns that – if you could see them from above – are hexagonal in cross-section. Carving channels in such material would be more like knocking over skittles, as opposed to cutting through - say - a massive granite counter top. Columnar joints come in all sizes, and the large versions in the Channelled Scablands aren’t too shabby. Notice the cars - and the rock climbers at the base of the columns - for scale ! Smaller outwash channels carved into the steep walls of the main outwash channels tell us about the sequence of events in the Channelled Scablands. This “hanging valley” ends abruptly at the vertical wall of Grand Coulee - and is “hanging” way above the floor of the main channel. Here’s another example to emphasise that the flat floor of the hanging valley has been truncated by the erosion that formed the steep wall of the main channel. In other words, the hanging channel was carved first, then truncated by the erosion that formed the main channel. This is an important observation : it means that these subsidiary side channels are not tributaries that fed into the main channel - they are older. This view along the axis of the hanging valley we just looked at confirms that it is indeed an outwash channel in its own right : it has a flat floor, vertical walls, and a slightly sinuous course. So here’s the issue : we’ve established a time sequence, but how much time are we talking about ? Niagara Falls is eroding upstream at ~1km/1000 years, but from what I’ve shown you so far, we can’t distinguish here between slow (normal) and fast (catastrophic) erosion rates. Dry waterfalls – or cataracts – seem to be pretty rare on Mars (and highly localised), but they’re a characteristic feature all over the Channelled Scablands. This cataract, mid-stream along a deeply incised outwash channel, was not carved by the waterfall you see today, but something much bigger that would have filled the channel to the very top ! Although impressive by Earth standards, it’s way smaller than the ~400m high examples on Mars. Notice the columnar jointing in the lava flows, and especially this amazing erosional remnant : see what I mean about “skittles” ? Looking upstream from the cataract we see how the outflow channel zigzags back and forth along its course – in a manner very reminiscent of the squiggly outflow channels on Mars. In the terrestrial example, it’s been established that older, pre-existing faults acted as lines of weakness and determined the zig-zag form of the channel. In the presence of similar fractures on Mars, all you would have to do is round off the corners of the martian examples to produce something very similar in shape and form. … such that even this “stunning” photo of a superficially similar modern canyon actively forming today in East Africa totally underestimates the erosional potential of catastrophic floods. Here we’re looking obliquely across the trend of Grand Coulee - upstream is to the left. In the middle ground to the right of the white patch is the rocky blade, made of horizontal lava flows. The rocky blade separates the cataract we saw in the previous slide from a second cataract – just as big as the first – that occupies the background in this image. Luckily erosion has breached the connection between the rocky blade and the twin cataracts, allowing us to see both of them. In this image – looking perpendicular to the trend of Grand Coulee - we see the full extent of the length of the rocky blade. What is this blade ? It’s a remnant of bedrock formed as the two cataracts - on either side of the rocky blade - cut their way back upstream (left) in lock-step with each other. Why is this important ? Because it is one of the most characteristic features of cataract formation – and therefore outwash channel formation in the Scablands. To drive this point home, here’s an example – looking obliquely upstream - of twin cataracts carved into the plain above Grand Coulee : “hanging cataracts” if you like. The headwall to the cataract on the right is intact, as is the rocky blade, but the cataract to the left has been breached by ongoing erosion. … here’s that lake again. We’re looking downstream along the axis of the cataract toward the Columbia River - and the bedrock on the right is the narrow rocky blade that separates this cataract from its twin (further to the right, on the other side of the blade). Look at Steamboat Rock (~100m+ high), sitting isolated in Grand Coulee. It’s the most iconic tourist attraction of the Channelled Scablands. What is it and how did it form ? Local geologists interpret Steamboat Rock as the largest remnant rocky blade in the area - isolated as its flanking cataracts cut their way back upstream (to the right) and left it behind. So here’s the first take-home message : twin cataracts with rocky blades are a common and characteristic feature of the Channelled Scablands. Why aren’t they common on Mars ? Are they even present ? Do you see rocky blades in this picture? As I already told you, the martian model for the formation of outwash channels by catastrophic floodwaters is based upon assumptions and computer models, but what’s the direct, observational evidence in favour of erosion by catastrophic floodwaters in the Channelled Scablands ? It’s this : boulders of basalt lava, 1m+ in size, that absolutely cover flat ground – as far as the eye can see – at the downstream end of Grand Coulee. Geologists interpret these as “shot” blasted from a “shotgun” represented by the floodwaters rushing through Grand Coulee. In order to carry these - and throw them tens of km over this flat ground - requires enormous volumes of water traveling at frighteningly high speeds. Large potholes carved into the flat floors and benches of bedrock in the outwash channels also provide the basis for estimating volumes and speeds for floodwaters to pluck large basalt columns to form these holes. In addition, the outwash channels of the Scablands form a loosely interconnected system, with water passing from one channel to the next on its way downstream. In several cases, the floor of the downstream channel stands 100m higher than the floor of the upstream channel – which means that waters in the upstream channel had to be at least that deep and flowing fast. So, in the Channelled Scablands, putting it all together, you get a fascinating dynamic model that I’ll summarise with this wide-field overview image of Dry Falls and its rocky blade in Grand Coulee (upstream is to the left). Floodwaters were catastrophically released from Glacial Lake Missoula to the East ~15,000 years ago toward the end of the Ice Age. Flowing at speeds of up to 110 kph across an extensive flat plain underlain by horizontal lava flows full of closely spaced cooling fractures, floodwaters up to 100m deep even on the plain, cut outwash channels – up to up to 100m+ deep themselves - into the bedrock, principally by a mechanism of cataracts eroding their way back upstream. Note that, if the plain was submerged, then the outwash channels must have been overfilled, and the cataracts themselves were submerged and out of sight. From the air – had you been there - all you would have seen would have been a water surface with standing waves, gently inclined to the West (Pacific), with local indications of turbulence at depth - and the whole thing would have exploded and subsided inside of a week. Now that’s a catastrophic flood ! Most local geologists believe that there were in fact numerous floods (40-1000), but all agree that the features I’ve shown you here were the product of the big one : the last one ! #1 : Where are the missing cataracts ? You might think that perhaps they have been eroded away, but science cannot progress on the basis of negative evidence. #2 : Why are geometrically similar features so different in size on Mars and Earth – and why are the martian examples so huge ? #3 : Where did the huge volumes of water required by the catastrophic floodwater scenario for Mars come from ? To date, no-one has come up with observational evidence for the catastrophic melting of permafrost, though this is commonly cited by proponents of the catastrophic model. #4 : Where’s the observational evidence on Mars that distinguishes normal from catastrophic erosion rates ? On Earth it includes boulders and potholes – as well as elevation differences - too small or too subtle to be detected with the current platforms that orbit Mars. We’ll just have to be patient in order to address this question. In addition, while the catastrophic floodwater model is the most commonly accepted explanation for the martian outwash channels, it is not the only one. Others include the highly contentious – but serious suggestion that outwash channels were carved into bedrock by very fluid, low viscosity lava flows at the surface. So, what’s my conclusion ? Yes indeed, similar processes appear to have operated to form outwash channels both on Mars and in the Channelled Scablands on Earth, but more work is required in the part of planetary scientists before they can really determine if the processes operated in similar proportions – and at similar rates - on the two planets. The last word has yet to be spoken in this on-going scientific debate ! 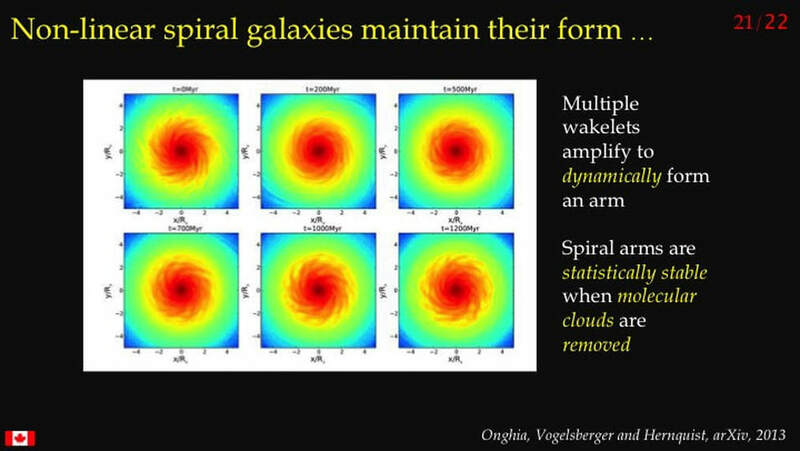 For a more extensive discussion of this entire question, see : Video - OAWS 2014. For more extensive images of the trip, including the Burgess Shale and Drumheller dinosaurs, see flickr.com/photos.